Despite Walter Kempowki’s first success as a novelist coming with the autobiographical Tadellöser und Wolf in 1971, it was only last year that he began to appear in English with the final volume of his ‘German Chronicle’, Swansong 1945, which consists of thousands of personal documents, newspaper reports, letters and diaries collected and collated by the author. This has been followed by a translation of his final novel (by Anthea Bell), All For Nothing, published in 2006, one year before his death. Despite the weather and the distant guns, the estate owners, the von Globigs, live a life relatively sheltered from the hardships of the war. Though the husband has enlisted, he is currently posted in Italy far from the front line; his wife, Katharina, largely spends her time at leisure, insisting she is left in her room to read undisturbed. Their twelve-year-old son, Peter, has even been excused membership of the Hitler Youth on account of his tonsillitis. Only Auntie makes an effort to keep the estate running, roaming the rooms in her trousers and two cardigans while shouting at the imported servants (a Pole and two Ukrainians). From the start, All For Nothing feels like a Chekhov play: the snow, the country house setting, the procession of regular and irregular visitors. The way in which the past washes across the present also feels very like Chekhov: Peter’s sister, Elfie’s, room preserved from the day she died; Katharina reminiscing over a day spent at the beach with another man, Sarkander, when her husband was in Berlin for the Olympics. Here, the threat to the family comes from the war, something they have avoided up to this point but which will now encroach upon them entirely. “Pack it all up!” he tells them. For the visitors, the house is a sanctuary, a place where food and warmth are available; at the same time, all of them are moving on. In the novel’s second half the question of whether they should leave Georgenhof becomes more urgent. Columns of refugees pass by until the nearby town is all but empty. 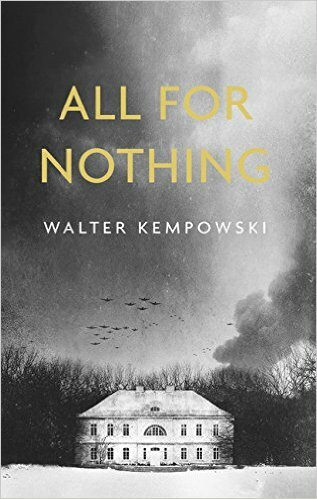 All For Nothing is a richly atmospheric novel. The von Globigs’ privileged position makes its difficult for them to understand the dangers which approach, both from the Russian advance and the local Nazi official, Drygalski, who has long looked for an excuse to take them down a peg or two (for example, insisting they use Elfie’s bedroom to house refugees). Even when she is in most peril Katharina thinks that Sarkander will save her on the basis of their day away. Even Auntie, the most practical character, refers more than once to how well-treated they were by the Russians at the end of the First World War. None of them can accept the powerlessness which the novel so exemplifies, encapsulated in its title. Despite all this, however, Kempowski still manages to pull off a surprise at the end. You are currently browsing the archives for the Walter Kempowski category.